(Last Updated : 30.07.18). 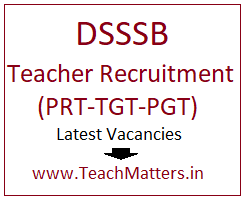 Delhi Subordinate Service Selection Board Teacher Recruitment 2018 - DSSSB has afresh invited online application for Teacher (Primary) against advt. no. 1/2018. Earlier, the Board had re-advertised 9232 (9956) Teaching Vacancies for all the post (PGT, TGT & C&V Teachers) which were earlier withdrawn for post codes (14/17 and 17/17 to 80/17) against advt. no. 2/2017. 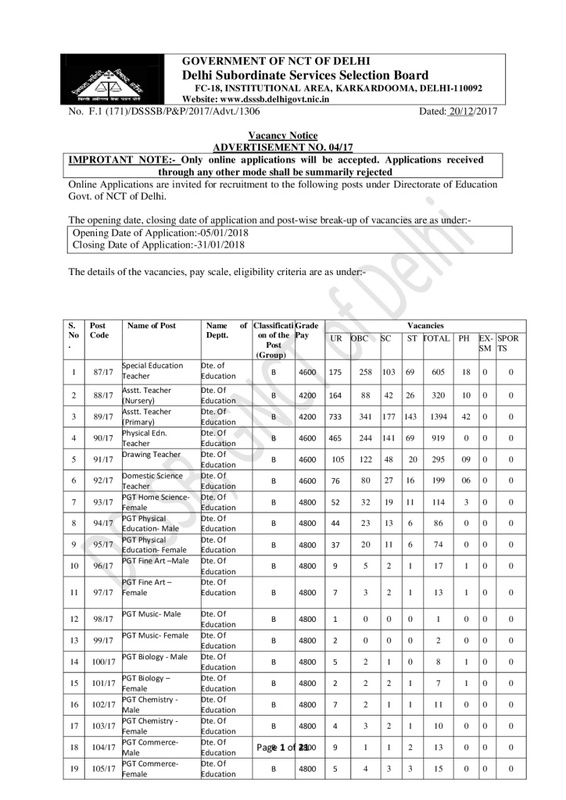 The Board has invited online application for recruitment for various teaching posts of PGT, TGT, PRT, Drawing Teacher, Domestic Science Teacher, Physical Education Teacher, Nursery Teacher & EVGC in MCD and Department of Education (DoE). Eligible and interested candidates can apply online for these posts through Online Application Registration System (OARS) website i.e. www.dsssbonline.nic.in as per the schedule given in the advt. no. 01/18. Check here latest updates on Delhi Teacher Recruitment 2018 Advt. Notification, Vacancy Details, Eligibility Criteria, Syllabus, Exam Pattern, Exam Schedule & Admit Card. Latest Updates (27.06.2018) : DSSSB has invited afresh online application for the post of PRT against advt. 01/18 under MCD. Note : Read Detailed Advt No. 1/18 before online application and check official website of DSSSB or you can visit here for latest information. Check new exam pattern and syllabus of Delhi Teacher Recruitment 2018 by DSSSB.